What’s better than a silent film screening eh? A free silent film screening of course. The Barbican is camping out at Canary Wharf this August to stage three outdoor screenings of feature-length silent comedy classics and you won’t have to pay a penny to attend. Neil Brand will be accompanying on the piano while the assembled crowds enjoy Monday night screenings of Buster Keaton’s The Navigator and The General and Harold Lloyd’s Safety Last. There’s nothing like watching silent comedy with a large, lively audience and Neil Brand is always on top form, so these shows should be inked in your diary already. Set during the Civil War and based on a true incident, The General is considered to be the one of the greatest comedies of all time. Buster Keaton plays Johnnie Gray who loves his steam train The General. When Union soldiers penetrate Confederate lines and steal his locomotive, Johnnie sets off in hot pursuit – and seven of the film’s eight reels are devoted to the nail-biting chase. 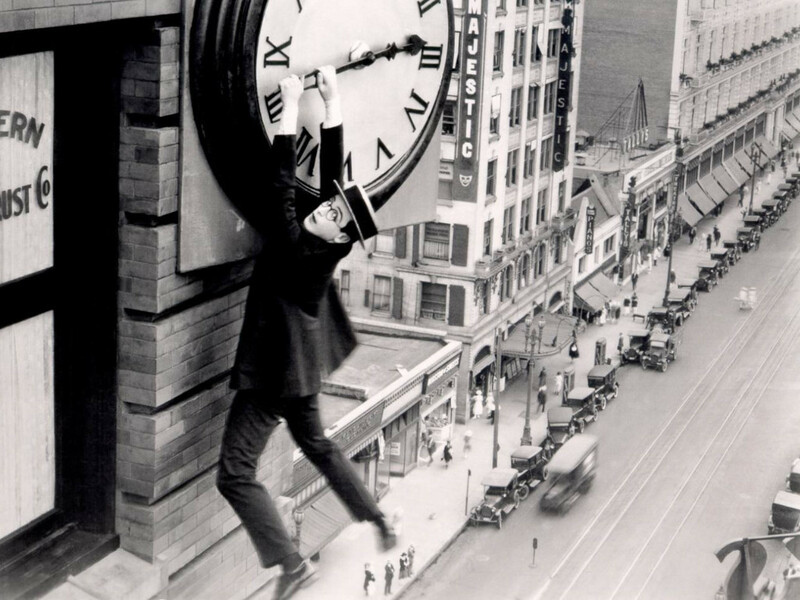 In Safety Last!, Harold Lloyd’s most famous comedy, he plays a sales clerk in a department store who finds himself hanging off the hands of a collapsing clock on the side of a skyscraper high above the streets of downtown Los Angeles. Harold’s legendary building climb is breathtaking and hilariously funny at the same time. A sequence achieved without any special effects. Keaton’s biggest box-office success tells the story of inept millionaire Rollo Treadway and Betsy O’Brien (Kathryn McGuire), his rich, pampered girlfriend, who find themselves on a huge deserted liner adrift in the ocean. The Navigator is one of Buster Keaton’s finest films. Hopefully some of the financiers of Canary Wharf will be tempted to leave their offices and join in the fun – it’s got to be more of a laugh than banking.